If you’re hoping to install your dream conservatory, you may be curious about whether you’ll need planning permission. Here at T&K, we understand that this can be a worrying process, so to provide some clarity we’ve created this short guide. If you reside in Northamptonshire or the surrounding areas, you can apply for planning permission through the Planning Portal. Follow the link here to get started. Planning application advice and fees for Northampton homes can be studied by using the link here. The conservatory must not cover more than 50% of the size of the existing house. It doesn’t include any balconies, verandas or raised platforms. Its height is no more than 4 metres and not higher than the highest part of the existing roof. It must not front or obstruct a public road. No more than half the area of land around the original house is covered by additions or other buildings. It must not extend beyond the rear wall of the original house by more than 3 meters if an attached house, or by 4 meters if a detached house. Bear in mind that these limits are for single-storey extensions built between the 30th May 2013 and the 30th May 2019. Guidance is likely to change after then. Plus, they only apply to conservatories which are to be built on houses. Planning permission is always required for conservatories built on flats or maisonettes. 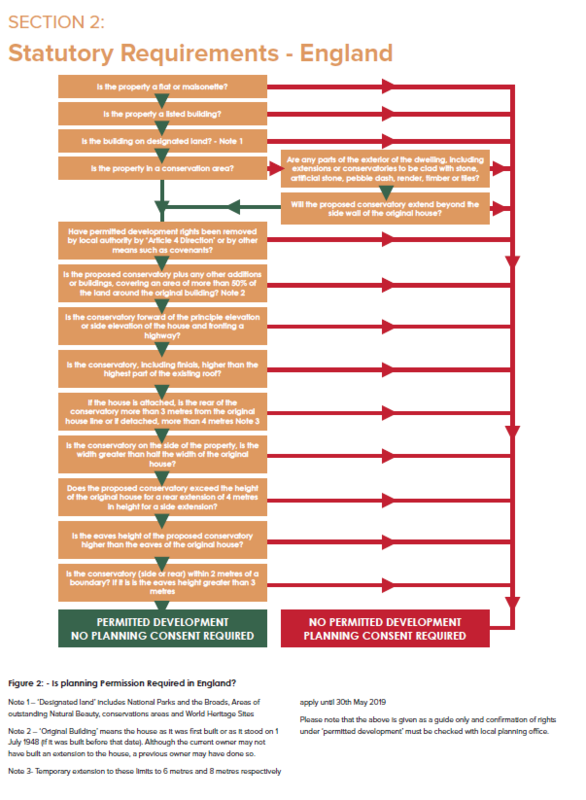 There are other instances when planning permission may be required too, which are covered below. If you live in a conservation area and want to build a conservatory, planning permission may be required, even if it adheres to the aforementioned limits. Conservation areas are areas where local councils are obliged to preserve special architectural or historical characteristics. Therefore, further restrictions on the alterations you can make to your property tend to be in place. Conservation Areas covered by the Northampton Borough Council can be found by following the link here. In such areas, check with the local planning authority to determine if planning permission is required before beginning building work. The intention of AONBs is to conserve and enhance the natural beauty of the landscape. Similarly to conservation areas, they tend to restrict what you can and can’t do to your property. Therefore, checking with your local planning authority is essential before any work begins. If you live in a listed building and want to build a conservatory, listed building consent is likely to be required. This consent is required for alterations or extensions to listed buildings that affect its character as a building of special architectural or historic interest. Check with your local authority Conservation Officer, to determine whether or not it is required before building a conservatory. You should be able to contact them through your local council’s website. There are other potential restrictions to building a conservatory which should be taken into account. An application template can be downloaded by following the link here. Once filled, it should then be sent to your local planning authority. These are binding conditions that are written into the deed of a property or contract by a seller which determine what modifications to the house or land can be made. This can include installing a conservatory. Restrictive covenants should have been highlighted by your solicitor when you purchased your home. Whilst they do not affect planning permission, you are liable for prosecution if you perform building work which violates a restrictive covenant. For further advice regarding planning permission, contact the T&K team today. With over 40 years’ conservatory installation experience, we’re incredibly informed on the process. You can give us a free call on 0800 622 716 or send us an online message.